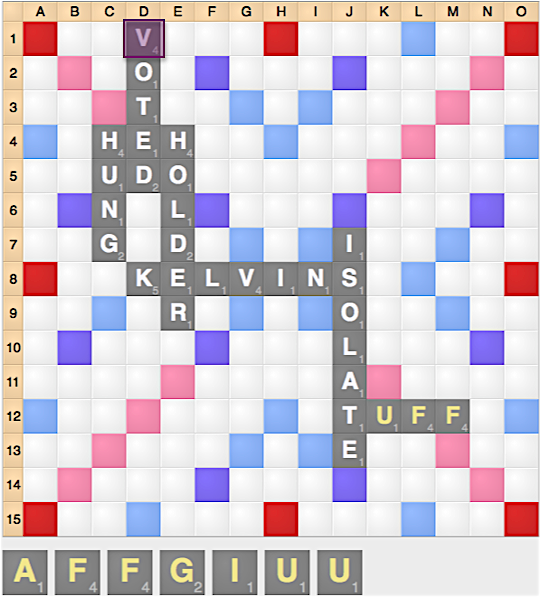 Vowelitis is one of the most common Scrabble ailments that drive new players crazy. After all, there’s just not much you can do with a rack of vowels: they don’t score well and there’s not all that many words that help you play them off consistently. Many vowel-laden racks force you to exchange. Learn the vowel-heavy words. 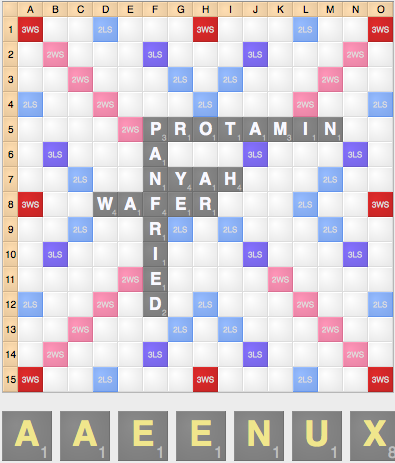 There are many words that will allow you to spend many vowels on one turn: the full list is available here. Spend an hour or two memorizing this list and it will sometimes help you treat your vowelitis. Prevention. Vowelitis occurs usually because someone kept a bad leave: they kept 3 vowels and only 1 consonant, or they kept 2 vowels in a pool that was extremely vowel-heavy. While vowelitis doesn’t always doesn’t always occur from these leaves, doing so is playing dice with the world and will inevitably lead to symptoms. In the left diagram, by sacrificing a few points and taking the time to find EAUX 4i (48) instead of the automatic XU 6j (54), you can help prevent vowelitis. In the right diagram, by getting rid of a good tile like the S and playing SEQUOIA, you can also help prevent vowelitis. Preserve tiles that can help with vowelitis. Certain tiles such as the D, the L, and the M along with certain tile combinations can help lessen the problem with vowelitis. For example, if you keep AIIL on your rack, an A or O draw will still allow you to play AIOLI or AALII. If you need to keep vowels on your rack, try to make it so that at least one of the vowels will allow you a good scoring play next turn. A play like WOE c11 is actually fairly immune from vowelitis. 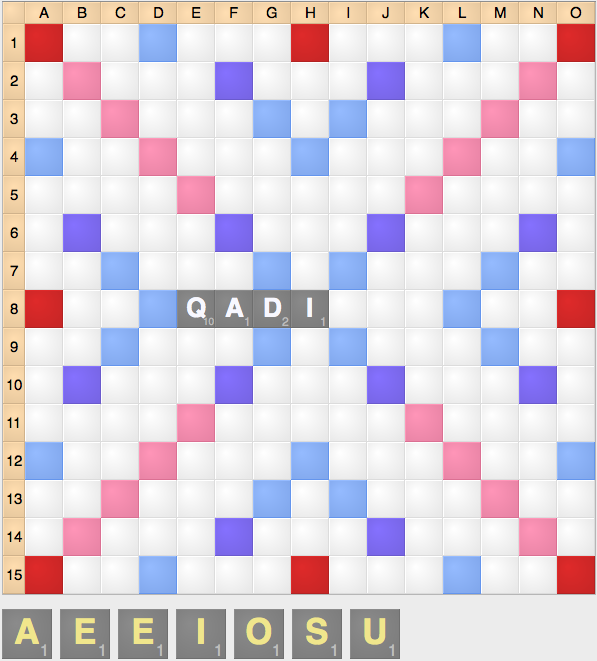 Although EAU k9 is only 10 points, the Q at 4i will often allow you to save yourself even after vowel draws, since an A draw gives you AQUAE, a U draw gives you QUEUE, and an I draw gives you QUAI. Similarly, a play like TUFF is also immune because of the V at d1. The I gives you VIGIA, the E gives you VAGUE, and the A gives you GUAVA. 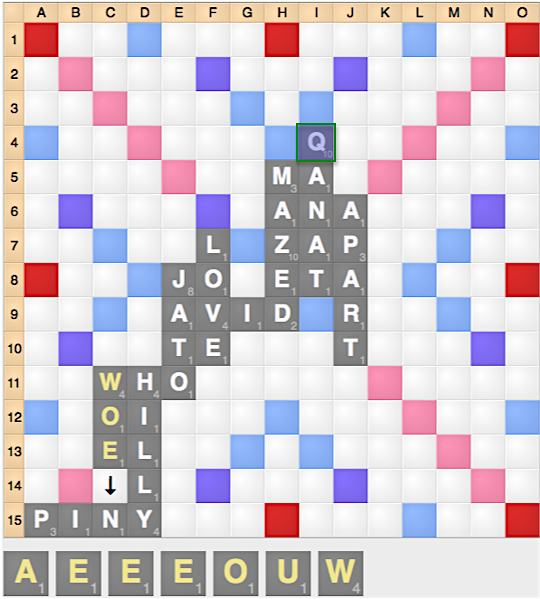 Often there will be different spots on the board, but you should try to preserve letters that will give you good plays, even with bad draws. Once you’re infected, swallow your medicine: exchange your rack. The main reason why vowelitis is such a strong disease is that people allow it to hinder themselves, rack after rack after rack. An exchange might score 0 next turn, but you’ll make up for it by scoring more in the future.